DataKL Review 2019: Is DataKL a Good Hosting? DataKL offers affordable packages to its customers along with an abundant list of features they can make use of. They are the perfect host if you want to start with a smaller package and switch to an advanced one as your requirements increase. DataKL is a Malaysia based web hosting provider that has been in business since 2006. It prides itself on its affordable packages and abundance of features. Their office is in Kuala Lumpur where they can be reached during working hours. To date, they have registered over twelve-thousand domains, received over two-thousand clients, completed over a hundred projects and won three awards on the way. All this is a result of the commitment they have shown in providing the best services to their customers. DataKL combines the power of CloudLinux with Hardware Raid to give you an ideal shared hosting environment. There is an easy to use cPanel control panel that gives you easy access to all your data, files and websites. They also offer cPanel account migration in case you are moving to them from another host. Just get in touch with them through the support and they’ll guide you on the procedure to follow. With the help of the Softaculous application installer, you can install over 300 scripts on your website by following basic steps. This eliminates the need to know any programming knowledge and most applications work with a one-click installation system. You can use as many free SSL certificates as you like on all hosting packages, which is an important feature in terms of your website’s security. They have personalized Email accounts to help you personalize your business with the unique Email addresses both for you and your team. Even though they are offering shared hosting, they still do their best to isolate websites that are taking the major share of resources. This means you do not have to pay for someone else’s resource usage. And it keeps the risk of your website going down stay low. DataKL offers three different hosting packages named Starter, Business, and Premium. All offer limited storage and bandwidth while Business and Premium allow multiple domains. The remaining features are the same in all packages which makes the decision to select the right package much easier. They are pretty helpful in terms of scalability and if you start from a small package and want to upgrade later, just get in touch with them and they’ll be happy to help. Each of the above packages is subdivided into more packages but since none of them offer unlimited bandwidth or storage, it doesn’t make a big difference which package you choose. The differences are only minor. To get in touch with them, you can use the contact form on the website or call them from 9 am to 6 pm on working days. There is a 24/7 Support Ticket System which ensures that your queries can be worked on even on weekends but the absence of a live chat means you can’t directly and immediately get in touch with someone online. DataKL gives a good first impression and is a great solution for the average website owner who doesn’t need too many features. They provide good tech support and are willing to help their customers out with the technical issues if they don’t have the necessary knowledge. All in all, it is a decent web hosting provider that provides a stable service. 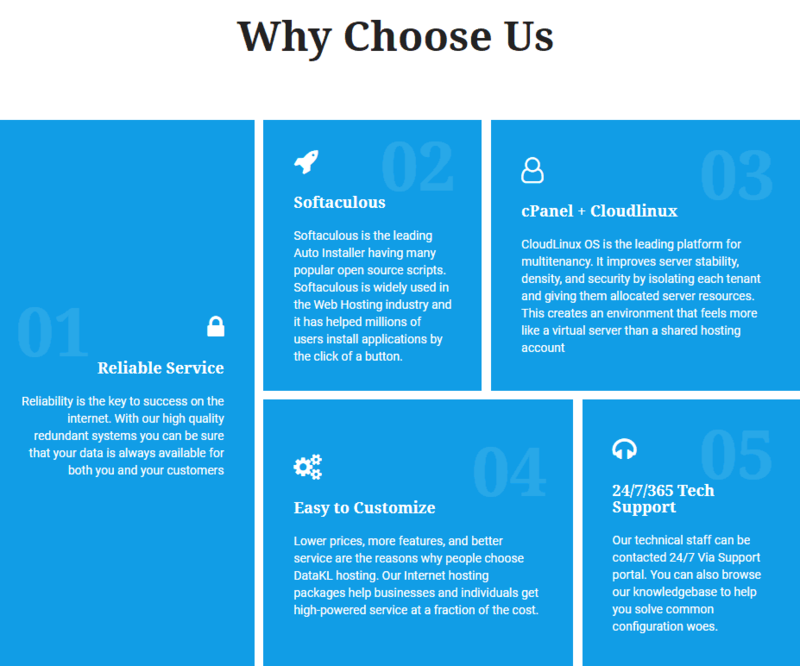 Wondering how DataKL stacks up against other Web Hosting companies? Enter any other Web Hosting company and we will give you a side-by-side comparison.